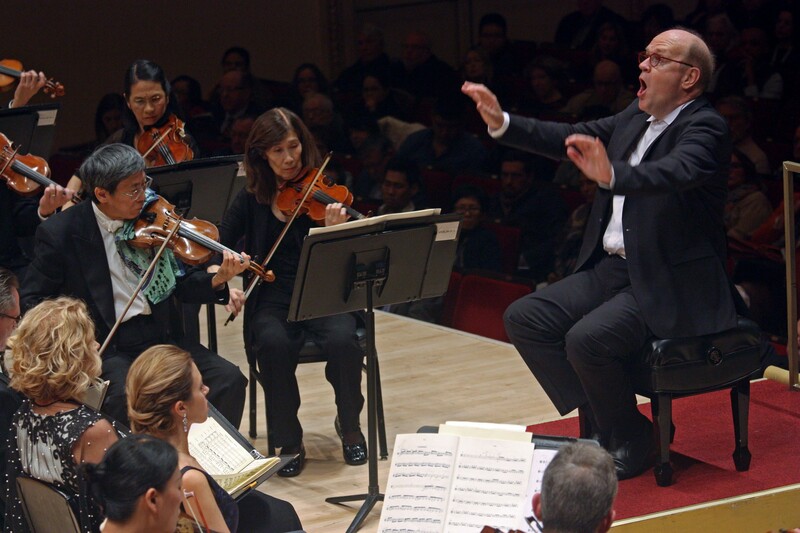 In his debut as the ensemble’s principal conductor, Bernard Labadie led the Orchestra of St. Luke’s on Thursday at Carnegie Hall. Connoisseurs love to talk about the distinct sounds of different orchestras. But there’s art in versatility, too — in the ability of a group of players to adapt, chameleon-like, to the demands of the given music and conductor. The Orchestra of St. Luke’s is such an ensemble. On Thursday at Carnegie Hall, the group gave a beautifully light-footed and expressively shaded performance of works by Haydn and Mozart under the direction of Bernard Labadie, its new principal conductor. Just three weeks earlier, on the same stage, this orchestra had accompanied the star tenor Jonas Kaufmann in an evening of operetta arias. On that occasion it showed off a chocolaty tone and the deliciously indulgent phrasing Austrians might label “mit Schlag” (with whipped cream on top). On Thursday, in Haydn’s restless “Nelson Mass” and Mozart’s brooding Requiem, the players produced a leaner, more airy sound. With its swift pacing and nervy fluctuations in warmth, their playing had all the best qualities of period-instrument performance — responsive to the music’s emotional eddies without ever breaking the flow. Mr. Labadie is a specialist in music of the Baroque and Classical era. In Quebec he founded two ensembles, Les Violons du Roy and the chamber choir La Chapelle de Québec, that have become first-rate proponents of historically-informed performance practice, known widely as HIP. But it’s not always easy to transfer that knowledge: In 2013 I was underwhelmedby Mr. Labadie’s efforts to HIP-up the New York Philharmonic’s Bach. By contrast, the Orchestra of St. Luke’s includes players — including its concertmaster, Krista Bennion Feeney — who are well versed in the period-instrument world. With Mr. Labadie at its helm, the ensemble looks set to develop a distinct profile on the New York scene. I certainly can’t remember hearing a better rendition of the opening bars of Mozart’s Requiem, with claustrophobic string figures under a yearning wind chorale — floating, evenly weighted, as on an updraft of air. It took the quartet of soloists a while to achieve similar balance. The soprano Lauren Snouffer sounded overpowered in the dramatic beginning of Haydn’s mass, her fine-grained, chiseled singing more at home in gentler moments. In ensemble numbers, the vibrant plush tone of the mezzo-soprano Susan Graham could also outmuscle Ms. Snouffer, and the strident singing of the tenor Lothar Odinius sat oddly alongside the sober elegance of Philippe Sly’s bass-baritone. Many of the most arresting stretches of the concert were those involving the excellent Chapelle de Québec choir. But the soloists found common purpose in Haydn’s “Et incarnatus.” On the words “sepultus est” — “was buried” — Mr. Labadie created an exquisitely transparent texture, with the soloists’ voices finely combined and just a tiny extra weight in the choir’s basses adding an eerie note of mystery. Performed on Thursday at Carnegie Hall, Manhattan. on Page C5 of the New York edition with the headline: A New Leader for a Versatile Ensemble.